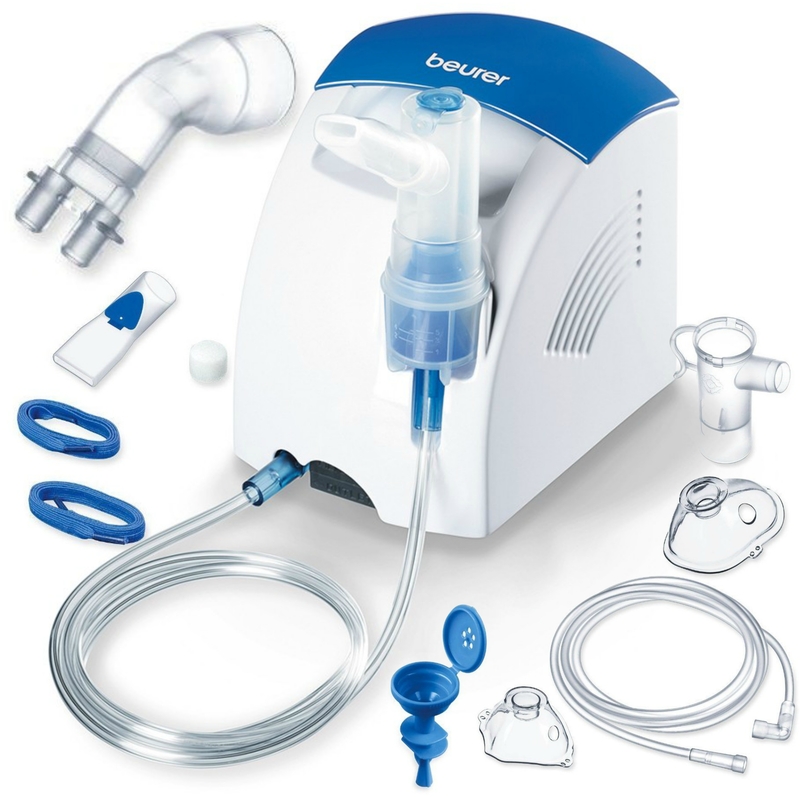 The Beurer IH25/1 is used to treat the upper and lower respiratory tract, colds and asthma and respiratory diseases. Compressed air technology is used for the nebulisation of prescribed liquid medicine. The Beurer nebuliser offers a high rate of medication vaporisation (>0.22ml/min), making the inhalation time shorter. 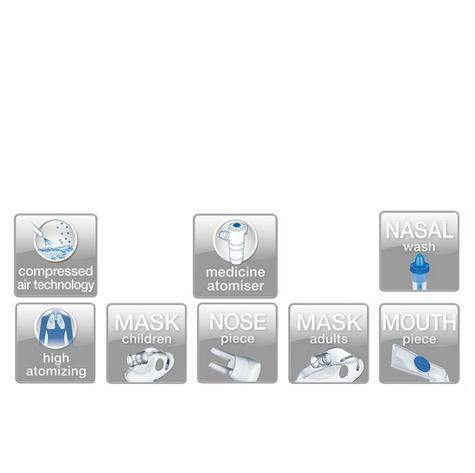 Included within the pack are a storage bag, mouthpiece, nose attachment, adult mask extra-long air tube and filter which can be easily cleaned and disinfected, ready for the next treatment. It is mains operated and is covered by a 3 year guarantee. A human being inhales and exhales approx. 10.000 litres of air over one day. In this enormous air mass there could be infectious agents, toxicants, allergenic or carcinogenic substances. These substances affect the mucous membranes which encase the respiratory system inside. Respiratory diseases are one of the most common diseases. It goes from common cold to chronic diseases of the respiratory system. 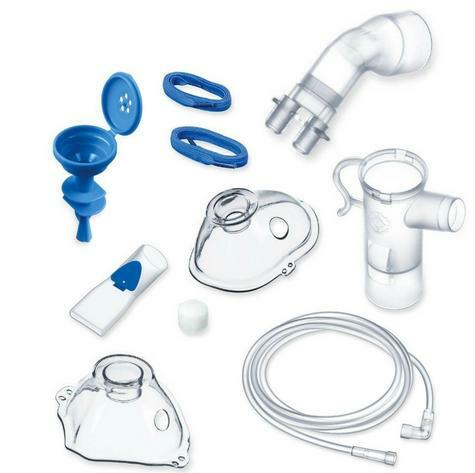 Different inhalation therapies help to relieve airway problems - and they may even become vital in some cases. Approx. 5 % of adults and up to 10 % of children suffer from a contraction of the airways, the so-called bronchial asthma. Inhalation has the advantage of bringing the active ingredient directly to the therapeutic target site. 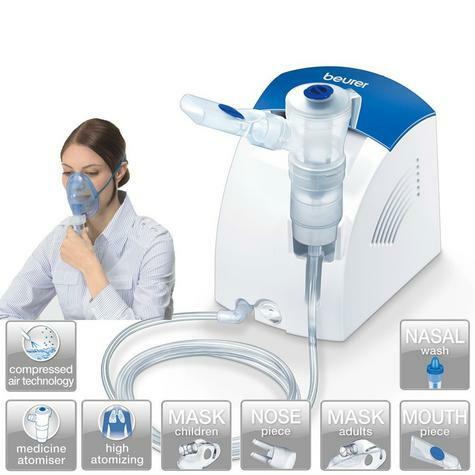 Inhalation therapy is suitable for respiratory tract diseases in general, inflammation of the upper airway, and asthma. Bronchial muscle spasms can also be relieved by inhalation of certain medicines, both in the long term and for acute episodes. In addition, the use of inhalation can prove beneficial in infections of the upper airway, pulmonary inflammation, etc. You should ALWAYS discuss inhalation therapy as well as the delivery and dose of medicine with your doctor. So how does inhalation therapy work? The effect of inhalation therapy depends on the active ingredient used, the nebulization rate, and the particle size. The nebulization rate is measured in ml/min and refers to the volume per unit of time discharged by the nebuliser. The higher the nebulisation rate the shorter the required inhalation time, because active substances are discharged at a higher volume. Inhalation which is as short and effective as possible is particularly important for children or people with chronic conditions. Regulation of the moistness of the mucous membrane. Support of the self-cleaning forces of the airways. Reinforcement of the natural resistance of the mucous membrane. Reduction of swelling and inflammation of the bronchial mucosa. Bronchial secretions are loosened and liquefied and this facilitates breathing. Respiratory tract infections are repelled. Bronchial muscle spasms are relieved and prevented. Inhalation therapy can be used both with the addition of medicines and with a normal saline solution. This is particularly beneficial in the presence of high dust exposure, tobacco smoke, or air-conditioned and dry environments. 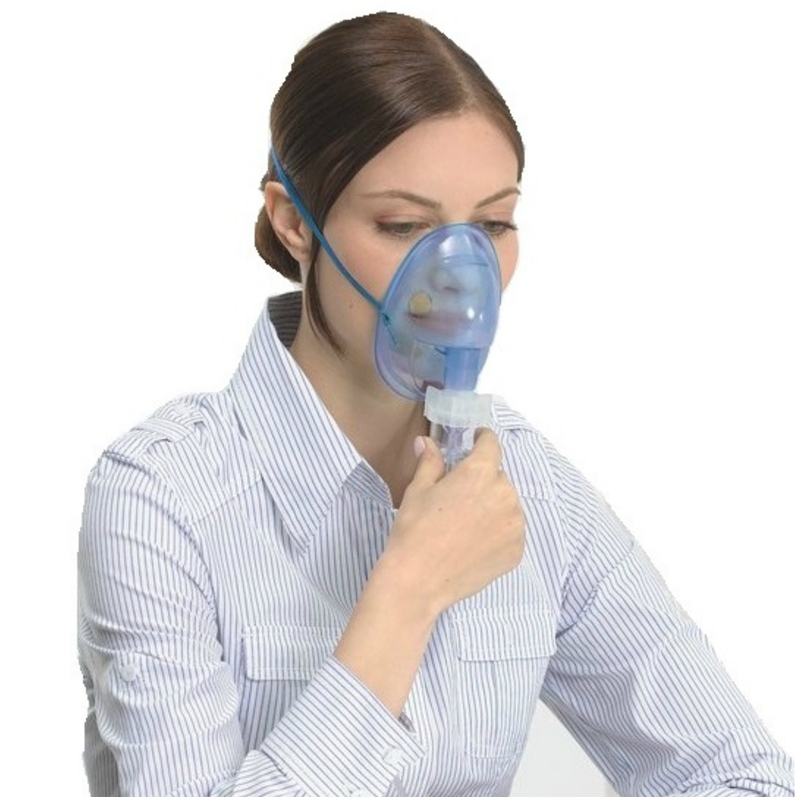 What are the benefits of inhalation therapy? Compared to treatment with tablets or injections, inhalation therapy has exceptional benefits: The active substance goes directly to the target site, while tablets or syrups are brought first to the gastrointestinal tract and only then carried via the bloodstream to the target site. Inhalation is more pleasant and is a more effective method of delivering medicines than an injection. There is less stress on the body since inhalation requires a smaller dose - for example when compared to the amount taken in tablets. There are fewer side effects since less active substance is present in the bloodstream and in not concerned organs.